Priya Parrish Hosts "Let's Talk About Impact Investing"
On Feb. 20, Priya Parrish of Schwartz Capital hosted “Let’s Talk About Impact Investing.” The event was the fourth in this semester’s Robert K. Wilmouth Speaker Series, a number of lectures hosted by NDIGI designed to further students’ knowledge of the science and art of investing. 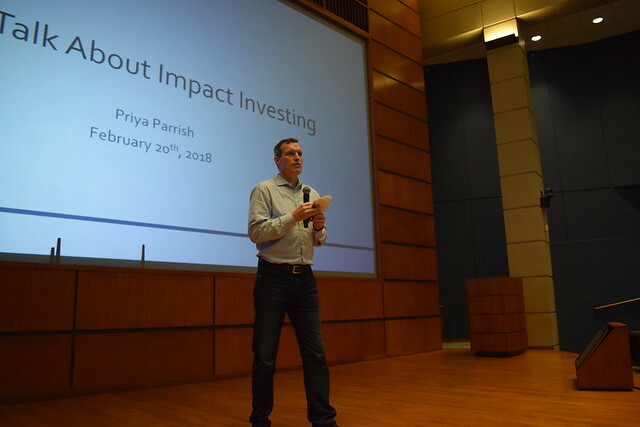 The objective of the event was to teach students about the history, growth, and future of impact investing and to inform them of potential careers in the field. Parrish graduated from Babson College in 2005 before earning her MBA from the University of Chicago Booth School of Business. She then served as a senior member of the investment team at Aurora Investment Management, managing multi-billion dollar hedge fund portfolios. Since February of 2015, she has been the Chief Investment Officer of Schwartz Capital. In addition to her role at Schwartz, she is an impact investor in residence at the University of Chicago, teaching and supporting impact investing programs at the Rustandy Center for Social Sector Innovation. Parrish described impact investing as “investments made into companies, organizations, and funds with the intention to generate measurable social and environmental impact alongside a financial return.” Impact investors finance companies with missions that produce some sort of beneficial change for the world without sacrificing a return on their investment. Parrish noted that this definition does not specify a specific social, environmental, or financial return, as there are a range of target outcomes in each investment strategy. How did Impact Investing begin? Though socially responsible investing has a long history, its most direct impacts began in the early 1970s when Vietnam War protesters demanded that universities no longer invest their endowments in defense contractors and arms manufacturers. After the Chernobyl and Three Mile Island nuclear events, impact investors turned their eye to environmental protection and sustainability. In the 1990s, it was used to combat apartheid by redirecting investments away from South African companies, and Pax World began the first socially responsible investment mutual fund. Over the past ten years, the term “impact investing” finally emerged as it became its own unique strategy with the direct intention of producing beneficial change in society. There are two different methods of impact investing. The first involves investing in established companies leading the way in managing their social and environmental impact within their respective industries. Parrish gave the example of an oil and gasoline company investing into the research and production of renewable energy. The other method involves investing in companies whose deliberate founding intentions were to solve specific social or environmental problems through their products. There are many strategies for investing in these companies. One of the most common, Parrish explained, is venture capital. Venture capital is a form of private equity in which investors provide capital to new companies or startups that have the potential for long-term growth. Because many of the companies impact investors choose to finance are small, they often require the resources provided by early-round investors in venture capital. Other investment strategies include traditional private equity and debt securities, which refers to instruments such as bonds or preferred stocks that can be exchanged between parties. What problems does Impact Investing seek to solve? Impact investing as a general strategy does not name specific environmental or social goals, and there are a diversity of possible outcomes any one investor may seek to achieve. Parrish stated that most investors, however, target the United Nations Sustainable Development Goals. The list includes such ambitions as clean water and sanitation, sustainable cities and communities, and responsible consumption and production. Learn more about the UN Sustainable Development Goals here. Parrish demonstrated that there are multiple ways for those interested in impact investing to get involved in the sphere. It is indeed possible, she stated, to work in impact investing immediately upon graduation. Because it is a relatively new industry, however, there are a limited number of roles available in this capacity. Beginning a career in a more traditional investment position and then moving into impact investing may open more of these roles, but may also lead to a difficult transition regarding cultural fit and mission alignment with the investment firm. The best way to enter a career in impact investing, Parrish explained, is to create opportunities. As the field continues to gain recognition, it becomes increasingly possible to apply the principles of impact investing to a broad range of careers across the finance industry, enabling both firms and individuals to develop their own socially responsible investment strategies. Parrish believes the future of impact investing is bright. As client demand continues to rise, she said, impact investing will continue to become more mainstream. Today, nine of the ten largest asset managers in the U.S. offer impact investing as an investment strategy. “There is nowhere in the broader investment community this is not touching,” said Parrish. As the field of impact investing continues to develop, Parrish expressed her hopes that it will increasingly drive environmental and social progress, and stand as a concrete representation of investing's capacity for good.